Why should kitty lovers have all the fun? What about us dog lovers? Don’t we deserve our own canine collector? – Angry dog lover. We hear ya! We hear ya! – Developers at Chronus. And up came an app that answered the prayers of bowwow lovers. Boku To Wanko is its name and it’s as cool as the Neko Atsume. 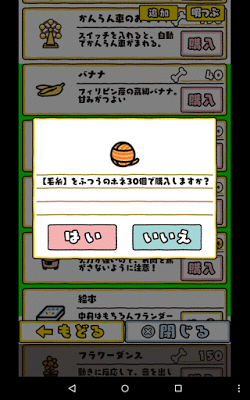 Everything is very similar to the cat collecting app. 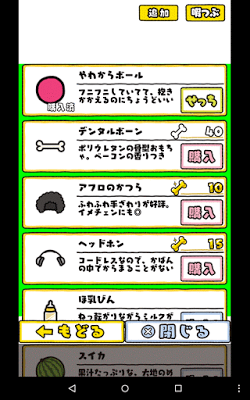 You will need to place cool toys and gadgets to attract puppies, get bones from them and use bones to purchase more toys. There are various dog breeds, including rare breeds that give golden bones. 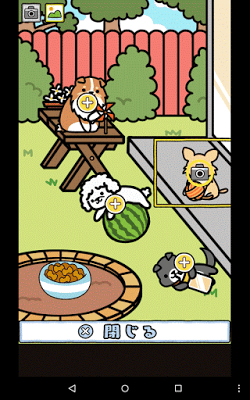 There’s also an evil cat which steals dog food and is probably included in this app to troll Neko Atsume and kitty lovers. Also, dogs appear in real time, so there’s no need to close the app, wait and then open to see who has checked in. To bring dogs to your yard, you will need to place some toys on it. Purchase toys before placing them in your backyard. Tap on “Shop” on the bottom of the screen and press the first box (yes the one with football icons to its left and right). Each toy costs some bones, so spend some bones to purchase your first toy. Later you may purchase expensive toys with the bones that you will get from dogs. These cute canines will give you some bones as a thank-you. There are two kinds of bones – plain white and golden. The golden bones are not easy to get, and usually appear beside expensive toys. Tap on the purchase button beside the toy icon to buy a toy. To confirm purchase, press the red button that appears in a pop-up box. To cancel a purchase, tap on the blue button. There will be another pop-up displayed on the screen. Press the button on it for a second confirmation. This will send the purchased toy to your store room. 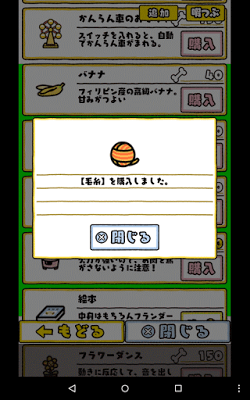 Next, press the yellow back button shown at the bottom of the screen to go back to the menu. To go back to your yard, tap on the “X” button at the bottom of the menu screen. Now you will have to place your purchased toy on your backyard. To do this, tap on the dog portrait at the bottom left corner of the screen. You will see the toy that you have recently bought from shop. Press the yellow border button below it. You will then be taken to your backyard. Tap on the plus icon to place your toy. You can place toys only on those areas that have a plus sign above them. Next, fill the bowl with dog food. An empty bowl won’t attract dogs. Tap on the plus sign above the bowl and fill it with dog biscuits. They are free and don’t cost anything. However, you can purchase expensive food to attract rare breeds of dogs to your yard. These generally cost golden bones and white bones. Make sure the bowl is always full to keep attracting cute dogs. Fill your yard with toys to attract more dogs. You can later expand it by adding more rooms. Go to shop and tap on the second box that has a green border around it. A room costs golden bones, so make sure you collect enough golden bones to purchase one. You can also buy bones. 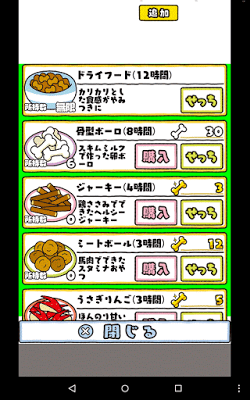 Tap on the third box with a yellow border. 250 white bones cost only 10 golden bones, whereas only 10 golden bones cost around 500 white bones. All bones that you get from grateful dogs will be stored under the gift-wrapped bone, which is located at the bottom-right corner of the screen. 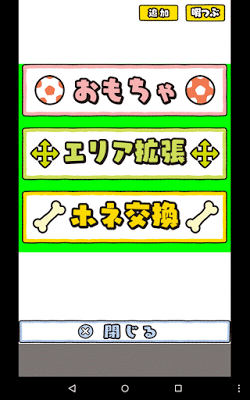 Tap on it and then tap on the button at the bottom to collect bones. The bones you will receive from a thankful dog could be white or golden in color. 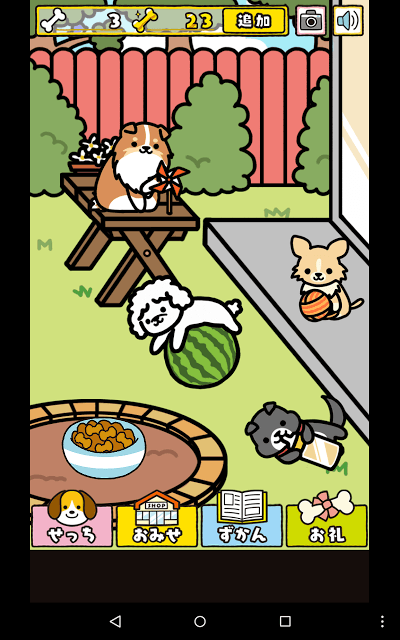 However, like the cat collecting app, this app also lets you get them for free. Tap on the camera icon at the top-right corner of the screen. Next, tap on the plus sign on a dog. This will make the camera viewfinder appear. Tap on the viewfinder to take a pic. Instead of tapping on the camera icon, you may tap on a dog to make the viewfinder appear over him. An enlarged snap of the dog will be shown on the screen. Tap on the red button below it to take its photo. Next, tap on the “Tweet” button. This will tweet your dog pic on your Twitter timeline. You will get one guaranteed golden bone or a few white bones for tweeting a dog pic. You can take pics many times and tweet those get more bones. However, there’s a trick that lets you get free bones without tweeting. All you have to do is tap on the Tweet button and your Android device will tell you to select the Twitter app to post your pic. Just don’t select Twitter from the list. Instead press anywhere outside the “Choose One” box to get rid of the apps selection box. You will still get your free golden bone reward. PS: The photos that you take will also be stored in your album. Tap on the album icon at the bottom of the screen. It is located beside the shop icon. Next, tap on the doggie pics to know more about them. 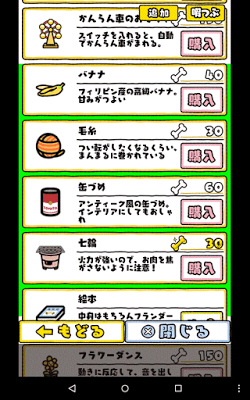 Pity the app’s is in Japanese else we would know a lot about them. The stats page is very similar to Neko Atsume’s cat album pics. 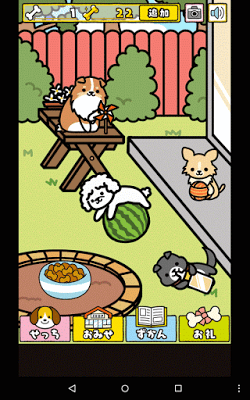 One unique aspect of Boku To Wanko is that you don’t have to close the app and then open it later to watch adorable animals play with toys. Just wait for a few minutes and a ticking clock will be shown, indicating that a cute canine has arrived at your backyard or room. 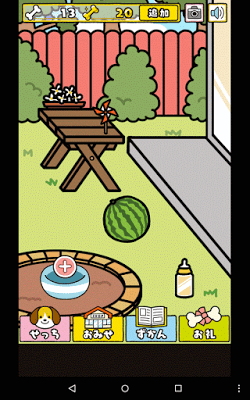 Sometimes, it takes more than a few minutes for a new dog to appear, but they do come to your garden to play with toys and you don’t have to close the app. Have patience and try to place some good toys, so that they give more bones. Yes, this doggie collector has everything, even an “evil” cat that steals dog food. The kitty appears randomly and can scare your dogs away. The app will notify you when she appears. Go to your yard and tap on the kitty multiple times to shoo her away. It seems the cat comes to steal food, although I can’t say with absolute certainty that’s the purpose of throwing a not-so-innocent-looking kitty. Maybe the developers were just in a trolling mood. 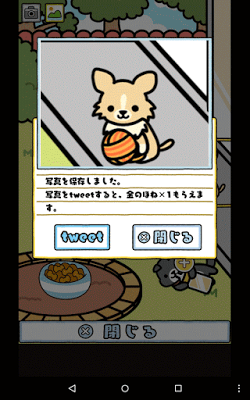 Anyway, it’s fun to see something different from a game that’s very similar to the cat collecting app.